The years may pass, the eras change, but there a few things that never do seem to change. Among the few of them is Adol Christin’s desire for adventure, which really knows no bounds. Following his adventures in the mysterious islands of Canaan, the red-headed adventurer and his best friend Dogi resume their journey towards the Afrocan continent, only to find themselves stranded on what seems like a deserted island, the Isle of Seirens, little knowing that the island not only has quite a history but also that it will be the location of their best adventure yet. As fans of the series probably understood already, Ys VIII: Lacrimosa Of Dana is set before Ys Seven, with Adol and Dogi still looking to reach the Afrocan continent and the Kingdom of Altago. While journeying on the Lombardia, Adol, Dogi and all the passengers, coming from different nations and with varying social statuses, will end up dealing with a mysterious beast which attacks the ship close to the Isle of Seirens, which is said to be an inhospitable island from where no one comes back alive. Adol’s quick battle against the beast doesn’t prevent the ship from capsizing, stranding all of its passengers on the isle. While Adol will wake up on a beach alone, it won’t take long for the adventurer to get closely acquainted with Laxia, Sahad and all the others who survived the Lombardia’s wrecking as well as reuniting with his pal Dogi. Not one to just give, the captain of the Lombardia hatches a plan to escape from the Isle of Seirens alive with all the surviving passengers. 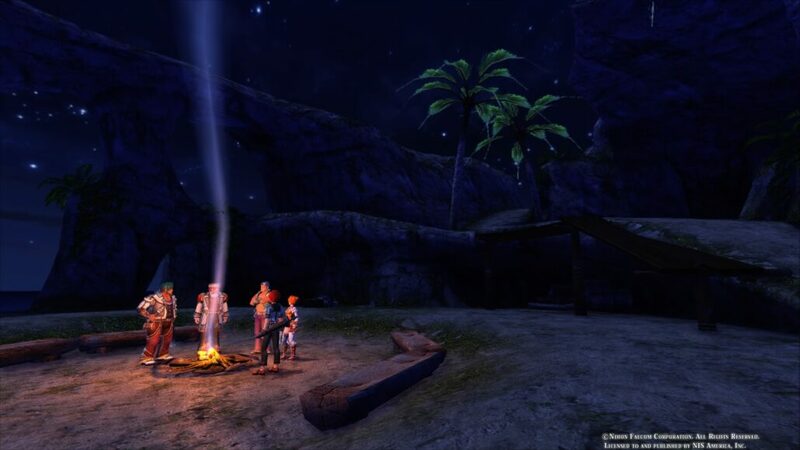 The first step is to create a base of operation, the Castaway Village, which can protect the survivors while aiding Adol and his companions in exploring the island. While getting deeper into the land, however, it’s clear how the Isle of Seirens isn’t just an island inhabited by monsters but has a rather intriguing history centered around an incredibly advanced civilization. Adol himself gets to see it for himself through his dreams, experiencing the life of the mysterious blue-haired girl Dana, who’s also one of the playable characters. Through the island’s exploration and dreams, Adol will also understand why the island is such a dangerous place. Ys VIII: Lacrimosa Of Dana features the same focus on story introduced in Ys Seven and expanded in Ys: Memories of Celceta, with character development and plot being much deeper than in the first six entries in the series. The new game steps everything up a notch, with every story elements feeling almost like the Trails series. The castaways are extremely well developed, with each one of them having some sort of role not only in running facilities in the Castaway Village, but also in the plot itself, as they are the main reason Adol is exploring the island. 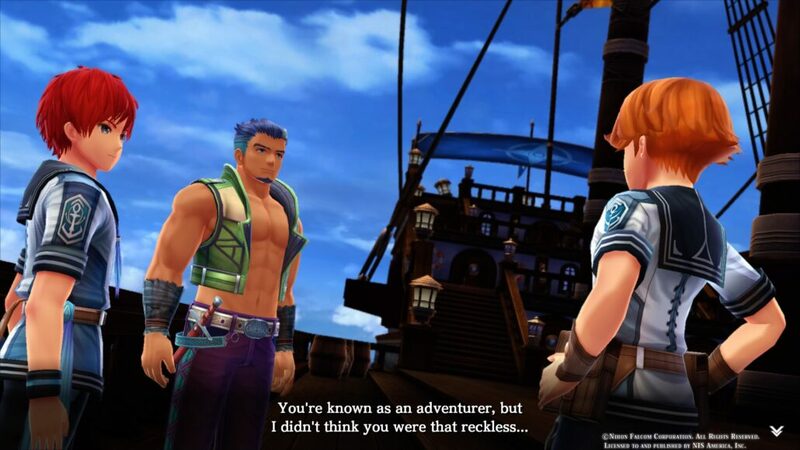 The main party members, while somewhat tropey, are also well developed, and even Adol’s personality manages to shine, as the available answers in dialogue highlight his positive and carefree attitude, and this feels extremely refreshing, considering the current trend of brooding, dark JRPG protagonists. The story overall doesn’t feel too different from previous entries, with Adol and friends preventing a great evil from getting what it wants, but it’s well executed, providing an enjoyable backdrop for all the action. Like for the story elements, Ys VIII: Lacrimosa Of Dana refines gameplay mechanics that have been introduced by the previous two entry in the series, but the difference between the new game and Memories of Celceta feels bigger than the Ys IV reimaging and Ys Seven. 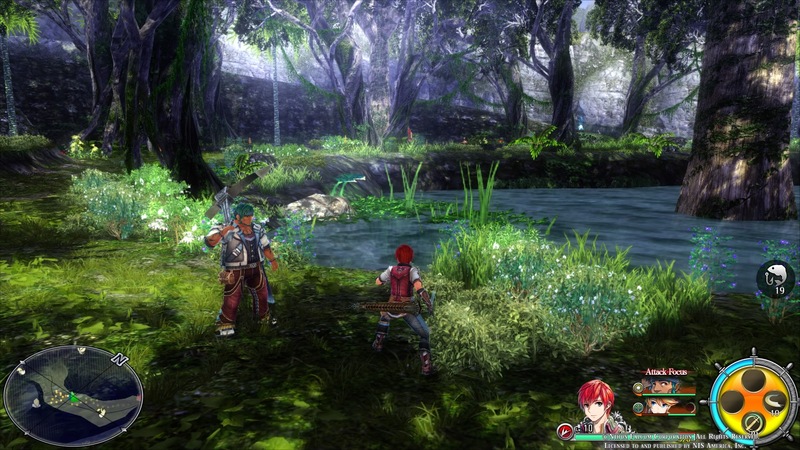 Coming back from the two previous games is the party system which allows players to bring Adol and two other characters on the field. All characters, who can be swapped on the fly, come with unique upgradable skills, learned by leveling up or by reading Manuals, and different attack attributes that are more effective against specific enemies: flying enemies are generally weak against Piercing attacks, armored enemies against Crushing attacks and so on. The defensive maneuvers from previous entries are also back, with Flash Move and Flash Guard being as useful as ever, the latter especially, as it grants invincibility and makes all attacks critical for a short amount of time. While the basic mechanics are not that different from the previous two entries in the franchise, Ys VIII: Lacrimosa Of Dana manages to feel fresh for a lot of reasons. Firstly, the camera system has been changed slightly and it now feels more like a true third person camera. 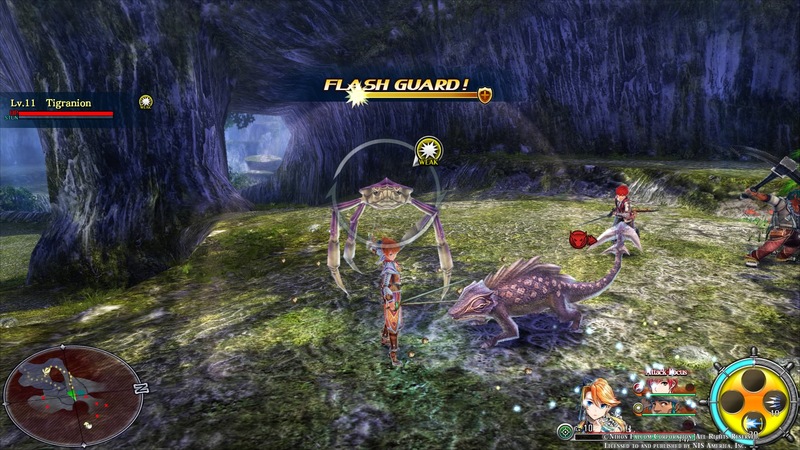 As the camera view can now be controlled, Falcom introduced a Lock-On system, which allows players to focus on single enemies in the most hectic fights. Additionally, the team added another system which warns players of enemies out of view that are about to attack. With these new features, Falcom not only moved the series forward but also prevented one of the most common issues of third person action games: getting hit by unseen enemies. The introduction of the lock-on system also makes boss battles better than ever without altering the series’ typical learn-the-patterns-and-counter system too much. Another new mechanic which makes fighting bigger enemies a bit easier is the Break mechanic, which leaves enemies briefly defensless and in juggle state after receiving multiple hits. Another huge change is the introduction of the Castaway Village. While the village basically acts as the game’s main hub, where players can purchase items, improve weapons, buy additional costumes for all characters and more, it actually plays a much bigger role in the grand scheme of things. After a certain story event, Adol will be asked to take care of the Village’s defenses like improving monster baits and more, improvements that will help him and the rest of the villagers in the Interception missions, mostly optional missions where players have to defeat waves of monsters. The performance in each mission will be scored and graded, and a higher grade will result in a better reward. Additionally, players can also use employs special skills from the castaways, skills that can be improved by increasing their approval of Adol’s. Approval increase is tied to the simple sub-quests that can be accessed from the village’s bulletin board which usually involve gathering items for certain villagers. While all this may seem a bit complicated on paper, it’s actually pretty simple to get used to all these mechanics, also thanks to the interplay between them: nothing truly feels tacked on just to extend play time. Exploration has also been slightly upgraded from past entries in the series. Like in Memories of Celceta, Adol will be tasked with making a map of the Island of Seirens by the Lombardia’s captain. Once certain milestones are reached, the captain will give Adol some useful rewards. Exploring the island fully also comes with other benefits, as players can gather materials used to improve weapons, craft items and mix potions, find treasures and Location Points, landmarks that give more personality to the Mediterranean looking Isle of Seirens. While exploring, players also have the chance to fish and cook meals at camps, meals that grant the party some useful temporary bonuses. Special items required to continue exploration are also back, now named Adventure Gear. Thanks to them, players will be able to breathe underwater, climb over vines and more. Additionally, some obstacles will require a set number of rescued castaways to be removed, reinforcing the interplay between different gameplay features. With the Ys series known for its high challenge level, Ys: Memories of Celceta somewhat disappointed long-time fans by allowing players to stock up a huge number of healing items, thus making boss battles trivial even at Nightmare difficulty. This, thankfully, doesn’t happen in Ys VIII: Lacrimosa Of Dana, as the most powerful healing items can only be brought along in empty bottles and these are available in limited numbers. Other items found in the field offer decent healing, but they’re not as good as medicines, so resource management is quite important. Speaking of difficulty levels and empty bottles, Ys VIII: Lacrimosa Of Dana features a new difficulty setting called Inferno, where enemies are much faster and empty bottles are single use only, making for a truly brutal challenge. Normal difficulty is just right for those who never played the series before, while Hard and Nightmare offer an adequate challenge level for veterans without excessive frustration. In Japan, Ys VIII: Lacrimosa Of Dana has been released on PlayStation Vita before making its jump on PlayStation 4 and, as such, the game isn’t exactly the best looking PS4 title to date. Still, Falcom took advantage of the additional power offered by the Sony home console to make the Isle of Seirens look vibrant and beautiful. Character and monsters models also look quite good, compared to the latest entries, and everything runs at a smooth 60 FPS framerate, with only some very small frame rate drops in hectic situations and big boss battles. The soundtrack is also excellent, as it usually is for Nihon games, and voice acting mostly competent, with just some weird delivery here and there. Strictly speaking about the localization, Ys VIII: Lacrimosa Of Dana is ok for the most part, but it’s sadly not on XSEED’s quality level. As a long-time fan of the series, I have enjoyed Ys VIII: Lacrimosa Of Dana more than I thought I would, as the story focus introduced in Ys Seven and Ys Memories of Celceta somewhat changed the series’ breakneck pace in a way I don’t particularly like. With the new game, Falcom tweaked the balance between story and action, creating what’s one of the best action role-playing games of the year. PlayStation 4 version tested (code provided by the publisher). You can buy it via Amazon. It took years for Falcom to develop the perfect entry in the series, and with Ys VIII: Lacrimosa Of Dana, they finally managed to do so by refining the renewed story focus and gameplay mechanics introduced in Ys Seven without taking away what makes the series so enjoyable. With a well-executed, albeit not really original story, charming cast, fast paced battle system, engaging boss battles, tight challenge level and plenty of side-content, Ys VIII: Lacrimosa Of Dana is without a doubt the best entry in the series and one of the best action role-playing games released this year.